A local variation of popular Sour Patch Kids gummy candies. Our li hing mui powder gives this fruity candy an added kick. 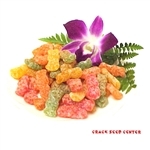 Try also our Li Hing Sour Apple, Li Hing Sour Watermelon, Li Hing Gummie Frogs, Li Hing Peach O's and Li Hing Apple O's.